For functions without deep levels of recursion, there’s nothing wrong with the algorithms shown in the previous lessons. I use this simple, basic form of recursion when I know that I’m working with limited data sets. But in applications where you don’t know how much data you might be processing, it’s important that your recursive algorithms are tail-recursive, otherwise you’ll get a nasty StackOverflowError. you’ll get a StackOverflowError, which is really counter to our desire to write great, bulletproof, functional programs. The actual number of integers in a list needed to produce a StackOverflowError with this function will depend on the java command-line settings you use, but the last time I checked the default Java stack size it was 1,024 kb — yes, 1,024 kilobytes — just over one million bytes. That’s not much RAM to work with. I write more about this at the end of this lesson, including how to change the default stack size with the java command’s -Xss parameter. I’ll cover tail recursion in the next lesson, but in this lesson I want to discuss the JVM stack and stack frames. If you’re not already familiar with these concepts, this discussion will help you understand what’s happening here. It can also help you debug “stack traces” in general. If you’re already comfortable with the JVM stack and stack frames, feel free to skip on to the next lesson. To understand the potential “stack overflow” problem of recursive algorithms, you need to understand what happens when you write recursive algorithms. 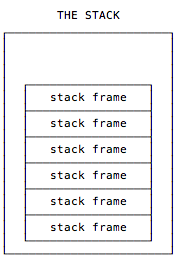 Therefore, you can visualize that a single stack has a pile of stack frames that look like Figure [fig:aSingleStack]. As that quote mentions, each thread has its own stack, so in a multi-threaded application there are multiple stacks, and each stack has its own stack of frames, as shown in Figure [fig:multipleStacks]. You can visualize that as shown in Figure [fig:stackFrameDetails]. First, word size is a unit of measure. From Chapter 5 of the same book, the word size can vary in JVM implementations, but it must be at least 32 bits so it can hold a value of type long or double. Next, the operand stack is defined here on oracle.com, but as a word of warning, that definition gets into machine code very quickly. For instance, it shows how two integers are added together with the iadd instruction. You are welcome to dig into those details, but for our purposes, a simple way to think about the operand stack is that it’s memory (RAM) that is used as a working area inside a stack frame. Each JVM thread has a private stack, created at the same time as the thread. A stack frame is created every time a new method is called. When a method is invoked, a new stack frame is created to contain information about that method. 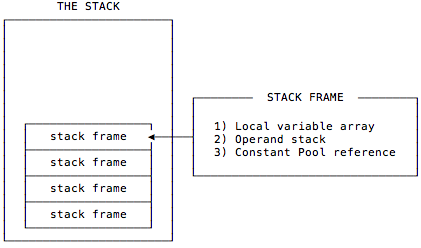 Stack frames can have different sizes, depending on the method’s parameters, local variables, and algorithm. As the method is executed, the code can only access the values in the current stack frame, which you can visualize as being the top-most stack frame. As it relates to recursion, that last point is important. As a function like our sum function works on a list, such as List(1,2,3), information about that instance of sum is in the top-most stack frame, and that instance of sum can’t see the data of other instances of the sum function. This is how what appears to be a single, local variable — like the values head and tail inside of sum — can seemingly have many different values at the same time. Not to belabor the point, but I want to share one last description of the stack (and the heap) that has specific comments about recursion. 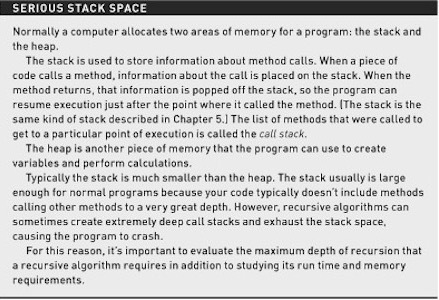 The discussion in Figure [fig:seriousStackSpace] comes from a book named Algorithms, by Sedgewick and Wayne. When a recursive function calls itself, information for the new instance of the function is pushed onto the stack. Each time the function calls itself, another copy of the function information is pushed onto the stack. Because of this, a new stack frame is needed for each level in the recursion. As a result, more and more memory that is allocated to the stack is consumed as the function recurses. If the sum function calls itself a million times, a million stack frames are created.